Detoxes, cleanses and chemicals! OH MY! I can absolutely promise you that Fitness with Rachel is now, and will always be, a detox and cleanse free safe space. But why? I have done a number of “cleanses” and “detoxes” in the past, but now, every time I see those buzzwords, I cringe. Today, I’ll share with you why I really hate how those words are being used to prey upon us. Let’s look at “detox” first. Actual detoxification is provided in hospitals under life-threatening circumstances — usually when there are dangerous levels of drugs, alcohol, or other poisons in the body. This idea that we need to continually detox using outside mechanisms simply has never been proven to be true for the vast majority of the general public. If you have healthy, functioning liver and kidneys, and you aren’t working around heavy metals or poisons without adequate protections, there’s nothing to detox from! No essential oils, herbal supplements, or amount of time spent in saunas will help you detox in any meaningful way from any perceived toxins. Please allow me a slight digression here. I think the word detox is sometimes being used in error. I hear about people “detoxing from sugar” quite often. What would be a better phrase, perhaps, is to be resetting one’s palate. I have yet to see a scientific study proving the addictive nature of sweets and sugar, but the more I consume it the more I crave it. An urge or craving is not the same as an addiction, however, and when my palate has reset to expect less sweets, less often, it’s easier for me to say “no”. That being said, no over the counter “detox” will help you crave sugar less. How about “cleanse”? That’s a slightly different beast, and usually involves a liquid diet, and/or heavy laxative use, designed to help you pee/poo out some imagined gunk inside you. It really is completely imagined though. Ask any gastroenterologist (they look inside your intestines) – there’s never been a single case of this intestinal sludge documented in scientific literature. Regular use of laxatives, especially the stimulant variety, can lead to re-bound constipation, too. A liquid diet might help you shed a few pounds quickly, but it will immediately return when you go back to solid foods, and probably leave you feeling pretty yucky in the meantime, too. The light-headedness, headache, general malaise and weakness? That isn’t the “toxins” leaving your body – that’s dehydration, caffeine withdrawal and/or caloric restriction. You can’t talk about detoxes and cleanses without also bringing up scary “chemicals”. First, everything is made up of chemicals. Just because you can’t pronounce something in the ingredient list does NOT mean that your body can’t handle it. Carboxymethylcellulose might be hard to pronounce, but this additive is used to improve and stabilize the texture of foods like ice cream, jellies, and beer. It’s used in shredded cheese to keep it from clumping together. It’s a carbohydrate that’s derived from the cell walls of plants and treated with acetic acid (found naturally in vinegar). Most importantly: Your body can’t break it down or absorb it—it simply passes through. Another way to view chemicals is to remember the an old adage: the dose makes the poison. Take fluoride; it’s not safe for babies to have in their toothpaste because they’ll likely swallow it, and that would lead to unsafe levels that their little bodies wouldn’t be as capable of handling. But for those of us old enough to know not to eat the tube of toothpaste, it’s just enough to keep our teeth strong and healthy. But way more often than not, you don’t need to even worry that you could get to a “poison” level. If you want more info, here’s a link to a great article that goes into great length about the quackery behind detoxes and cleanses. Here’s some more chemicals you do’t need to be afraid of. Of course, I still highly recommend eating closest to the source as possible. Minimally processed, mostly plant based, whole foods. But even if you’re eating at McDonald’s 3 meals a day, 7 days a week – doing a cleanse or a detox definitely wouldn’t be the way to counterbalance that. So please, please, PLEASE don’t waste your money on these marketing gimmicks. 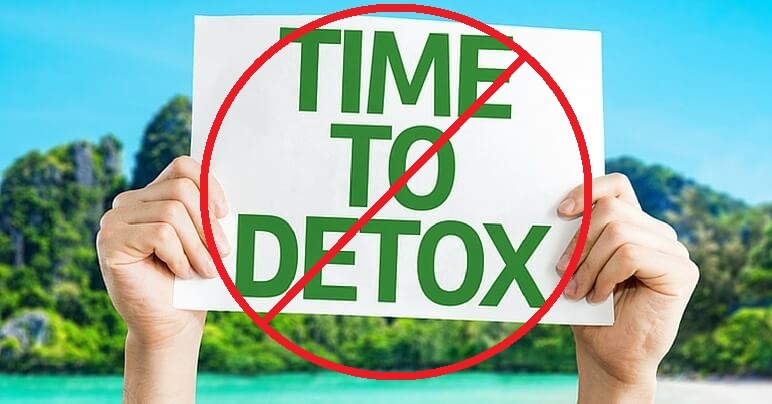 If you see “detox” on a package, “cleanse” in an infomercial, or the word “chemical” being thrown around – put it down, turn it off, lock up your wallet, and run away! And should you disagree with any of my points, I’d like to encourage you to keep an open mind, keep reading up, ask questions from those with lots of education in the related fields, and make sure they aren’t trying to sell you anything when you get their answers!